One of the most common – and most painful and nagging – kinds of injuries anybody has to deal with are those affecting the ankle. Whether it’s sprained, twisted, or simply banged up, chances are you’ve hurt your ankle. Athletes – and active people in general – are particularly susceptible to ankle problems, whether from running, jumping, or placing a kick incorrectly. And when that happens, you’ll probably find yourself looking for a good ankle brace to relieve some of the pain. Ankle braces can help avoid injuries such as sprained or twisted ankles, where the ankle suddenly goes perpendicular to your leg or becomes pronated; they keep the ankle and foot straight and supported. They come in a variety of configurations, from ankles sleeve made of. Should you find yourself already suffering from an ankle injury, ankle braces provide some stability and support as you recover. You may find yourself wearing one for several weeks to prevent you from re-injuring yourself, especially as you try to remain active and mobile and wait for swelling to go down. It’s important to choose an ankle brace that is appropriate for you and your ankle. There are a few different kinds to choose from; some features straps and hard inserts – whether plastic or steel – to provide support, while others are simply breathable, compression sleeves that provide some firmness and support. 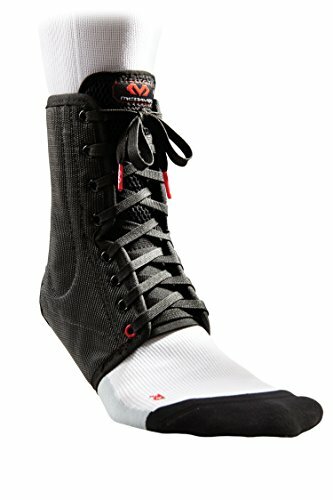 While compression sleeves are great for keeping swelling down, you will probably want to look at a complete wrap or brace if you really need support; a good brace will enclose the ankle, will have some way to adjust tightness – usually Velcro but sometimes laces, and will have supporting straps that wrap around the heel. The first, and most important, thing you can do when choosing an ankle brace is select the right fit. An ankle brace that does not fit properly will simply not be very effective at preventing injuries or helping you come back from one. Thankfully, there’s a host of options to choose from, and enough ankle braces to fit just about anybody. Think about the kind of sport you’re playing, and if you’ve already suffered an injury, the amount of support you’re going to need. Again, while basic compression sleeves might work for jogging or everyday activity, look for something with firmer support if you play more demanding sports or have a history of twisting your ankle; compression sleeves will not do a particularly effective job of preventing a twist or sprain. 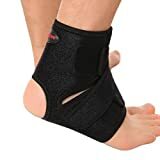 Likewise, if you have a moderate to severe sprain (Grade 2 to Grade 3), you’re definitely going to need a stiff brace that keeps your ankle firmly in place, as opposed to a compression brace that still allows for a full-range of motion (these will work fine for Grade 1 sprains). Sturdy velcro straps or laces are important, as they allow you to properly tighten and adjust the brace during activity, for a proper fit. If they are not properly sized, however, braces that use straps or Velcro to tighten may come loose over time. The McDavid 195 is another popular ankle brace, designed to work in a figure-6 shape, like ankle tape but made with nylon straps. A built-in arch provides a natural support and comfort for your heel and ankle. McDavid rates it with Level 3 Ankle support, intended for preventing and overcoming ankle sprains; they claim it offers three times the support of playing without one. It’s quite comfortable, with padded lining and a ventilated tongue to prevent overheating during sports and exercise. Overall, users of the McDavid 195 are quite happy with it. Some have noted that sizing tends to be off, running a little bit large. But the compression and support it provides work well for both recovering sprained ankles and for playing sports; it’s stiff, but not too bulky, and fits well with athletic shoes. If you suffer from heel issues such as tendinitis, however, it may not be a good choice (check out the Sleeve Stars Foot Sleeve for that). 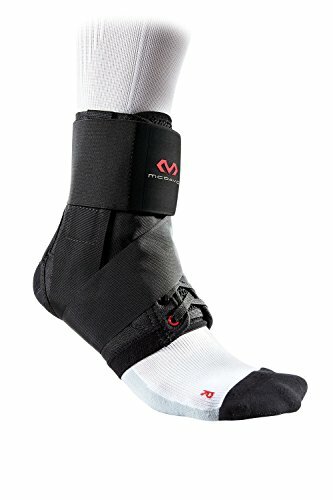 Lastly, McDavid is a trusted maker of ankle and knee supports, and they back up every product with their reputation – and their McDavid Guarantee, which ensures replacement in case of any malfunction. It’s our choice for an all-around ankle brace. Figure-6 design functions like ankle tape. Doesn’t fit well under some shoes. 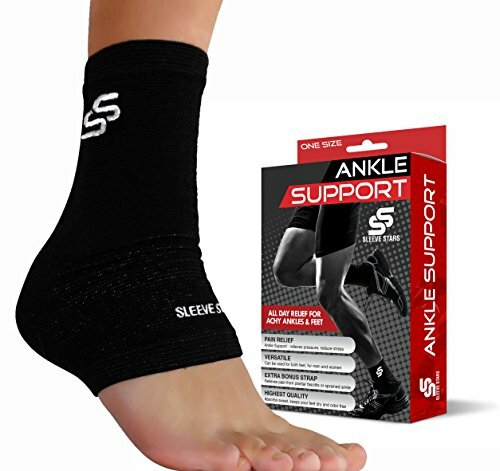 One of the most popular ankle braces on the market, the ASO Ankle Stabilizer is a durable piece that uses a figure-eight design with elastic cuff closures, laces and stabilizing straps to keep your ankles tightly wrapped and supported. It’s made from ballistic-grade nylon for durability, and a lightweight “Cool Flex” lining in the back of the boot, for added comfort while letting your feet breathe. The design fits both ankles and is low-profile enough to fit in your shoes. This design and its low cost makes it one of the most popular ankles braces on the market, and a top seller on stores like Amazon. 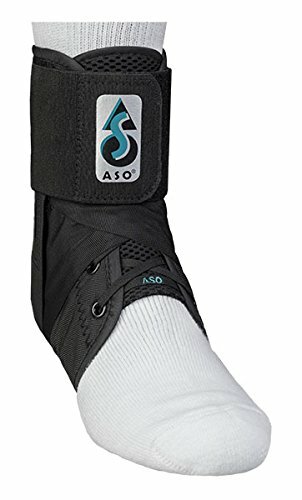 The ASO Ankle Stabilizer is almost universally well-reviewed, with high remarks for the support it offers, especially for recovery from sprains and other ankle issues; the shape of the brace keeps your foot in a neutral, 90-degree position that doesn’t allow for any inversion or extra rotation. The difference it makes to an injured ankle is almost night and day over walking without one. Firm and adjustable, it fits well within shoes. It does tend to run a little bit large, and some users have expressed a desire for more padding, citing it as uncomfortable. Overall, however, it’s an easy-to-use solution for recovering from sprains. Good for recovery from sprains. The Liomor is another very popular ankle brace, offering simple, straightforward support without any kind of bulk. The crisscrossing straps, made of durable elastic SBR and nylon, are moisture-wicking and feature vented perforation to keep your feet cool in action, eliminating odors and preventing bacteria from breeding on hot days. The design completely firmly supports your ankle joint, but features an open heel that allows for an even wider range of motion during activity. When tightly cinched, the straps also provide an ample amount of compression, which assists in taming swelling and inflammation. Overall, those who have used the Liomor really like it; it fits comfortably in just about any shoe, provides good support, and is easy to put on properly. Very affordable, it is actually the cheapest in our guide and a solid option for both prevention and keeping swelling down. Liomor also provides a Money-Back Guarantee should any problems arise. Open heel for increased range of motion. Not very stiff; does not provide the most support. The Sleeve Stars Foot Sleeve with Ankle Support is a two-piece brace that provides both general ankle support and specialized heel support. The first part of the system is a simple compression sleeve, worn on your ankle and heel, that helps to improve blood circulation and provide some relief from swelling. The second part is an extra strap, which is crossed similar to a strap like the McDavid 195 and adds an extra layer of support; when properly coupled, the two make an excellent layer of relief from conditions such as heel spurs, Achilles heel, and Plantar Fascitis. The fabric itself is moisture-wicking and machine-washable. Reviewers of the Sleeve Stars generally love it, finding that it provides excellent relief from Plantar Fascitis and tendinitis in both everyday use and active pursuits – especially when using the bonus strap. Some believe that it is too bulky to fit under shoes, as well as that it may not those with smaller ankles very well. It’s also well-built, and Sleeve Stars backs it up with a 12-month warranty and their 100% Money Back Guarantee. Bonus strap provides extra support and relief from plantar fasciitis, tendinitis, etc. 12-Month Warranty, Money Back Guarantee. May be too large for smaller ankles and feet. Two-piece design too bulky for some shoes. The McDavid 199 is the go-to brace for when you need serious support. It features spring steel medical grade stays to keep your ankle as stiff and stable as you need it; McDavid rates it with their Level 3 Maximum Protection, for Moderate to major instabilities and pain from sprains and serious twists. The boot itself is made from two layers of nylon and vinyl mesh fabric, and uses McDavid’s Padded HydraVent hDc Moisture Management Technology in the lining for moisture-wicking and to keep your feet cool. The full lace-up system keeps everything tight and firm. The 199 is built with the same quality standards and guarantees as their other products (like the McDavid 195); they’ve been doing it since 1969. Likewise, the 199 is as well-liked as the 19; it’s comfortable and amply padded, but provides ample support as well. Many find it perfect for recovering from sprains, but also for post-surgery recovery; it makes a lightweight alternative to a boot. If you’re still active and trying to avoid aggravating your already weak joints, it’s still slim enough to work with your running shoes. Some find the lace-up design easier to use than a figure-8 style wrap. There have been a few sizing issues mentioned, so be sure to properly size and adjust it before wearing. It’s our choice for an ankle brace with extreme support. Extreme support with spring steel stays; stiffest brace on our list. Works well for recovery from sprains. HydraVent hDc Moisture Management to keep feet cool. Our Top Pick for an all-around Ankle Brace is the McDavid 195, thanks to its firm support and stabilization. The figure-6 design is easy to use – similar to wrapping ankle tape – and the compression it provides is ample as well. And if you need even more support, you can’t go wrong with its big brother, the McDavid 199.